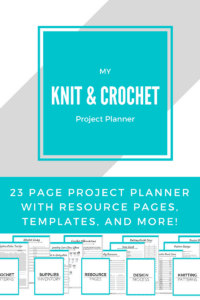 Welcome back to the Knitting for Beginners series! 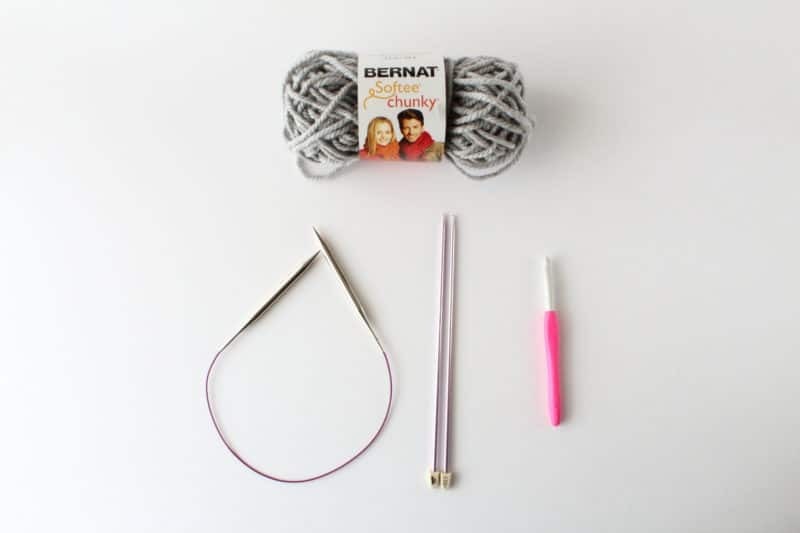 Last time, we talked very simply about the tools you’ll need to start knitting and what we’ll be using in this series. Today, we’re going learn how to cast on knitting with a long tail cast on. 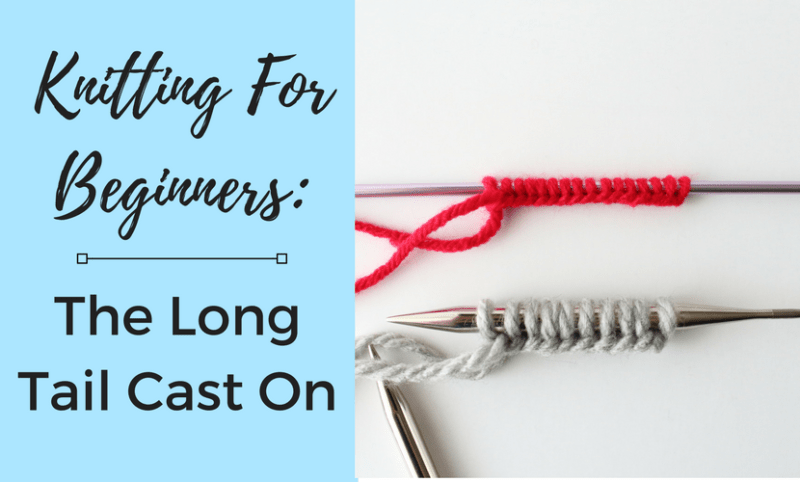 In this post, I’ll go over what it means when I say “cast on”, how to work a long tail cast on, and a little bit about some other ways to cast on knitting. Although today I’m just focusing on the long tail cast on, there are other methods to cast on and I will mention them in this post and have separate tutorials for them too. All three methods are included in the video though. So, ready to knit? 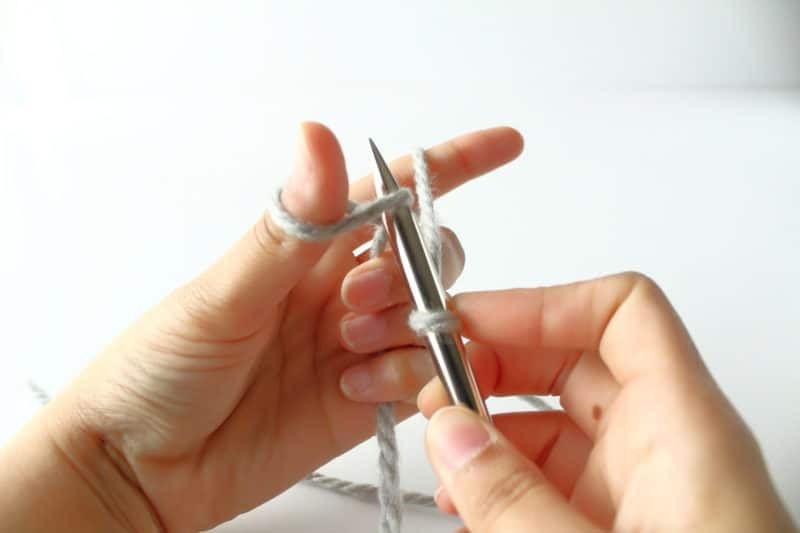 Casting on is a term you hear a lot in knitting and all it means is to get the yarn onto your needle so you can begin knitting. It’s basically the first row of your knitting, the same way a foundation chain is the first row of your crochet. The most used type of cast on is the long tail cast on. It’s the most versatile, but it can be a little bit tricky at first. Learning any new skill takes practice so keep working at it and you’ll do just fine. Sometimes other methods are easier for beginners though, so I’ve also included the provisional or crochet cast on and a knitting cast on method in the video below. Try them all and see what you like best. I’ll walk you through the long tail cast on in the video and then get into the step by step tutorial! For this tutorial, I’m going to be using some super bulky yarn and a 8.00mm needle. I’m using the interchangeable needles that I talked about last time in Part 1, but it works the same way with the straight needles. 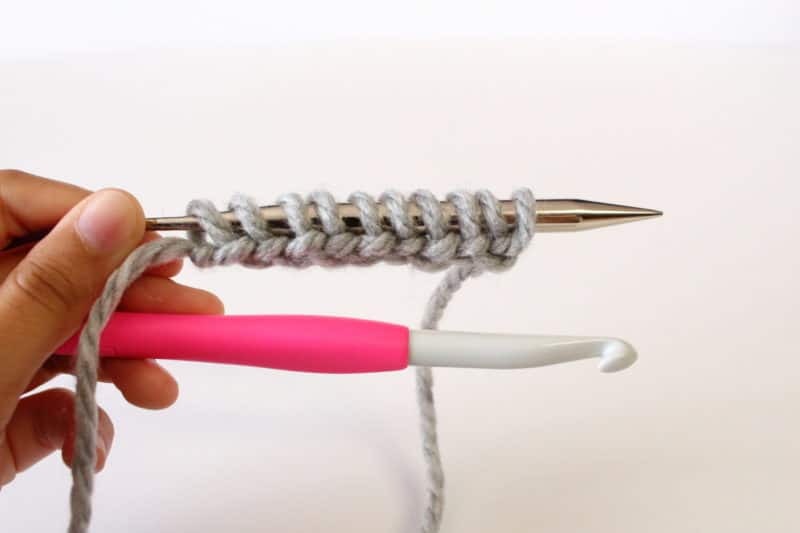 The crochet hook in the picture below is just going to be handy if you have trouble using the needles, but it’s not necessary. 1. 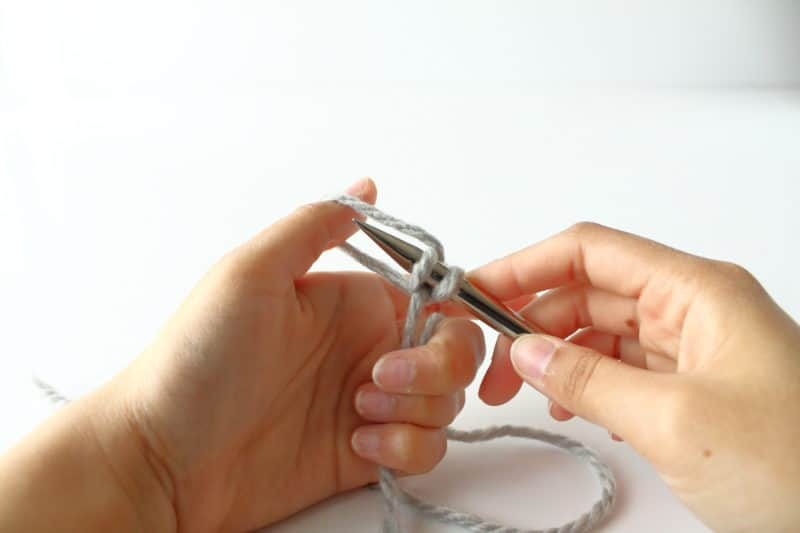 Start by creating a slip knot with a long tail, about a foot and a half. This is why it’s called the long tail cast on. You can see how I made the knot in the video, but all you do is create a ribbon shape, reach through the loop and grab a bit of the yarn. 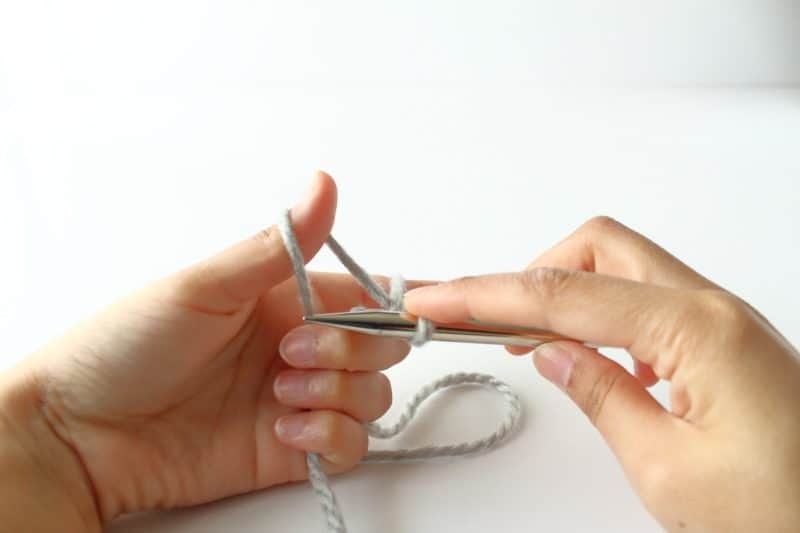 Pull it through the loop to create your knot. 2. Put your slipknot onto your needle tip, and tighten it so it’s snug on the needle. 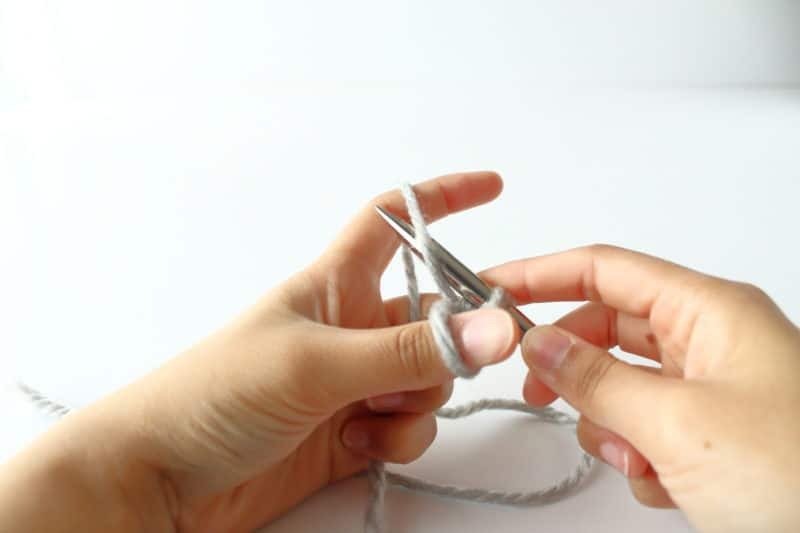 Then, with your needle in your right hand, using your thumb and index finger of your left hand to separate the working yarn and the tail yarn into a triangle shape. The tail end will go around your index, while the working yarn (from the ball) will go around your thumb. 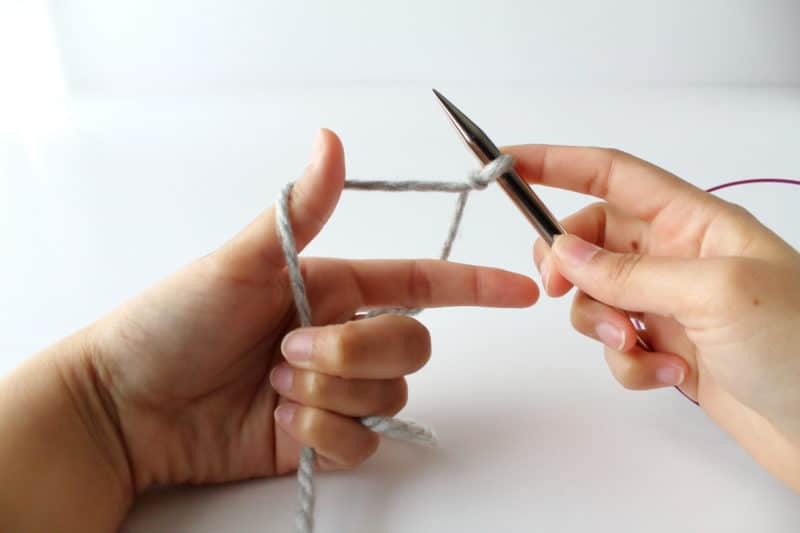 Hold the ends with your pinky to keep them flying all over the place. 3. 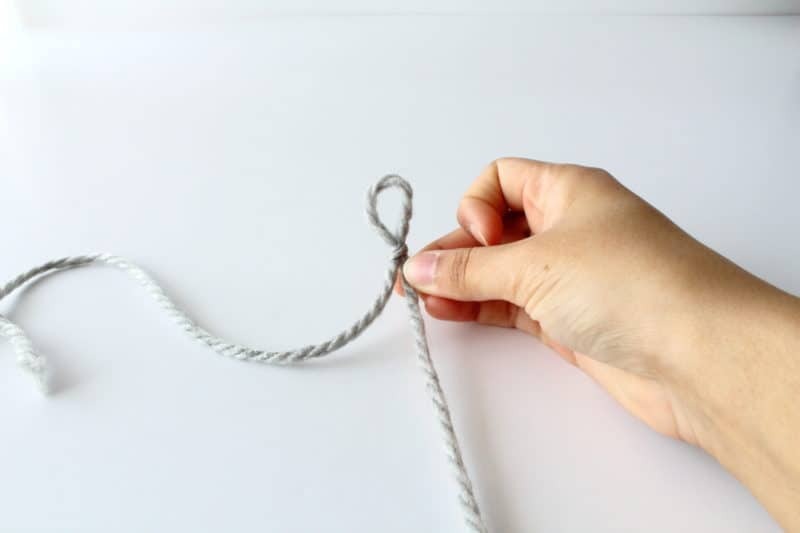 Place your finger on the slip knot to keep it from moving around too much. 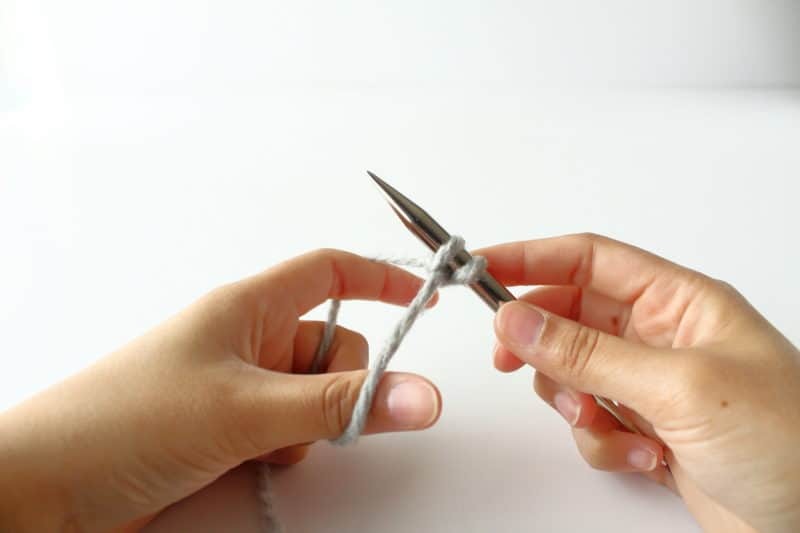 Bring the needle tip under the loop of yarn on your thumb. 4. 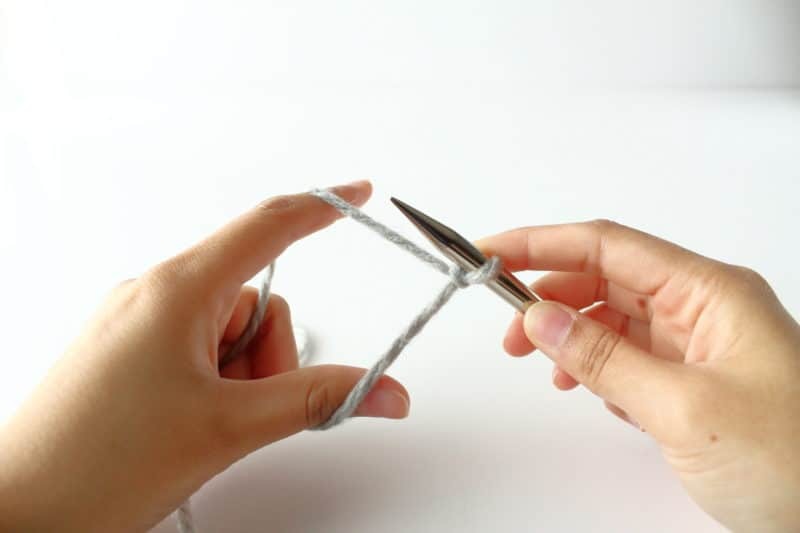 Then bring the needle tip around and under the loop of yarn on your index finger. This will wrap a loop around your needle tip. 5. Now move your thumb back and bring that loop over the needle tip. Or, you can think of it as pulling the loop you wrapped around the needle through the loop on your thumb. Either way, it will look like two loops on your needle tip now – one is the original slip knot and then the loop we just made. The video will help if these pictures seem too confusing! 6. 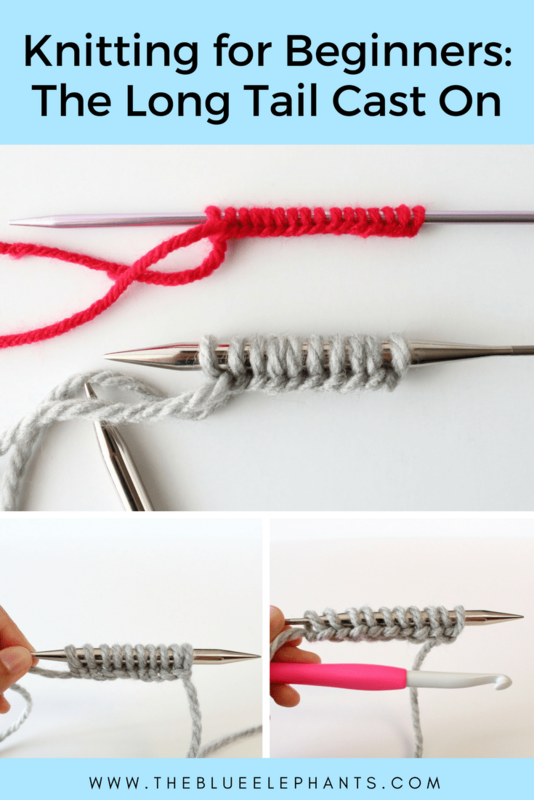 Finally, let go of the loop around your thumb and pull that yarn snug to tighten the stitch to the needle. That is the first stitch you cast on using the long tail cast on! 7. Repeat step 3-6 until you have as many stitches as you need for your project. For now, practice making 10 stitches. That is the long tail cast on! The motion can be a little bit awkward at first, but keep practicing. Your stitches will get better and more even as you go. Once you make your 10 stitches, take them off the needle and start over. I know you don’t want to undo everything! But this will help you practice. 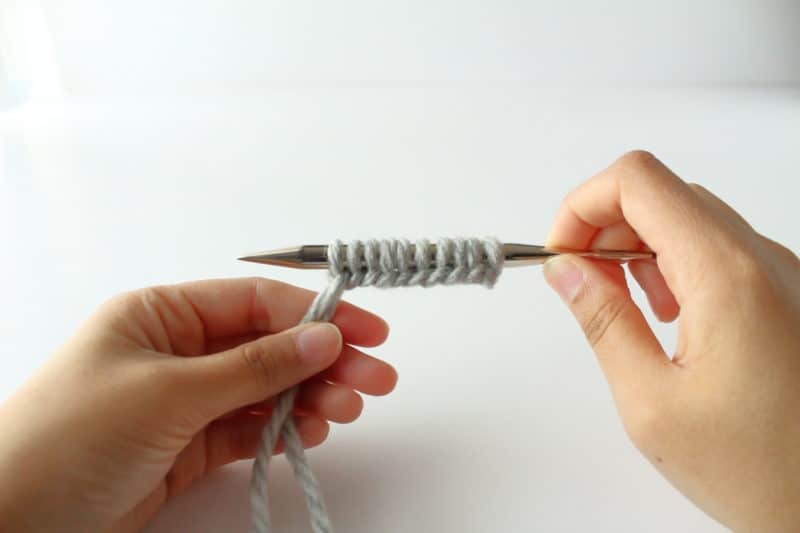 Once your hands get used to the motion, you’ll have a neater edge and you’ll be able to work without letting go of the loops between each stitch. I mentioned before that there are a few other ways to cast on that I wanted to talk about. The Long Tail Cast On is the most common, and you should absolutely learn how to work it. But, it’s not the easiest one (at least in my opinion). So I also wanted to show you the knitted cast on and the provisional/crochet cast on. I will try to have individual posts up for them soon so you can see the step by step, but for now, they are included in the video. They don’t look very different but they function in different ways when you get more advanced. Any of these cast on methods work great when you’re learning and will do just fine for our projects. Thanks so much for reading! I hope you found this helpful and are excited to get into the next lessons. I’ll be back next time with a tutorial on how to start working knit stitches. Right after that, we will have the first pattern for you to try out. 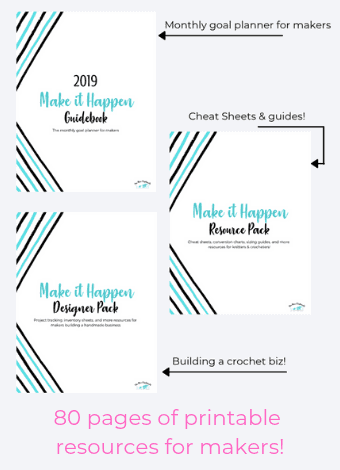 If you haven’t already subscribed, use the box down below to sign up for the newsletter and you’ll get new posts right in your inbox every week along with special freebies and tips!